A mentorship program was established to support early career teachers in a technology-rich K-6 school. This program included scaffolding for inexperienced teachers in school cultures, pedagogically appropriate technology use, and classroom management. The program assisted early career teachers to thrive at the beginning of their career and to address perceived weaknesses in teacher education programs. As a result of this research, several early career teachers received mentorship support and successfully began their teaching careers. 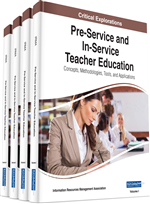 Additionally, many pre-service teachers were able to make decisions about their school careers through engagement in a practical and realistic teacher-training program. In theory, this research informs the literature regarding the realities of 21st-century classroom experiences and demonstrates the importance of having experienced educators provide training to the next generation of teachers. In practice, this research provides an example of how university teacher education can better prepare pre-service teachers to be successful in their future classrooms. This study took place in a large western Canadian city in two different educational environments. First, the early career mentorship took place in a K-6 school, and then the research moved to a teacher education program at a nearby university. The setting for this research involved an International Baccalaureate and a fine arts school in an affluent area of this large urban center. The classroom consisted of 30+ students with two full-timeteachers and one part-time educational assistant. The assignment of two full-time teachers was not part of the normal workplace environment in this school district—having two teachers with 30+ students was the result of extreme parental demands and opinions that their children’s educational needs were not being met with the ratio of students to teachers in the classroom. After a month of having one teacher working with the class, a second teacher was hired at the end of the first month of the school year. The newly hired second teacher had recently graduated from university, and this was her first teaching position as an early career teacher. She came to the school with high recommendations from her university professors and student teaching supervisors. The mentoring aspect of the research involved the interactions and planning that the two teachers initially worked on together.